Are you scared of the little baldness that has appeared on your scalp? Are looking older than what you actually are because of the thinning hair? Do not worry; Nu Hair Clinic has brought to you some of the best hair treatments that will keep you Youthful forever! This hair clinic specializes in various types of cosmetic surgeries that are aimed at keeping you fresh and young. We strive for developing customized treatment for each of our clients. We believe every person has a different type of hair and their problems are unique and must be addressed in the most specific way. This will help to eradicate the problems faster and the fresh and young look will revert back to the person. 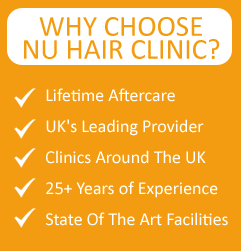 The Nu hair clinic offers Hair Transplant for men women in London and has been very successful in solving the hair related problems the people of London were facing. We have some of the Best Treatments that involve good doctors who are specialized in cosmetic surgery. The recent developments have taken place in the field of Facial Hair transplant. Let us find out the mechanism involved in Facial Hair transplant. Many men suffer from problems of beard and moustache growth. Often there are blank patches on the beard that look weird. The beard transplant takes almost a full day to perform and the beard can be shaved only after 10 to 14 days of performing the transplant. It has few side effects such as infection, swelling, etc. In order to mitigate this doctors often prescribe lotions and antibiotics that help in maintaining the newly transplanted beard. Doctors are of the opinion that the side effects are rare and can only be seen if there is rejection of the hair follicles that have been used. Facial hair transplant is often used to hide the scars. The process often involves FUE and the donor area is generally the scalp. Facial hair transplant might also involve Mesotherapy which is a procedure involving the application of medicines in order to stimulate the growth of hair. It involves application of solution that is enriched in specific vitamins and minerals that act as a booster to renew hair growth. Eyebrow restoration is another form of Facial hair transplant that involves grafting. It occurs mainly in women as a result of rigorous plucking. On an average 300 to 350 grafts are required for the transplant of moustache, 600 to 700 grafts for a goatee transplant, 200 to 250 grafts for sideburn and 300 to 500 grafts for a cheek beard. It is important to note that once the beard is transplanted it is not possible for that same hair be a donor in case there is a further requirement for a transplant, say the scalp. Once the facial hair is transplanted it adopts the characteristics of the natural facial hair and can be shaved just like the original facial hair. So do not keep worrying about your facial hair loss or sideburn. Just give us a call and book an appointment and experience the Hair Transplant for men women London.